Note: The following “paper” was originally researched and put together in late 2006. Since then, many of the links to OMB tables are no longer valid. Of course, the magnitude of all this nonsense continues to grow exponentially. But with the following, you can take take a peek at the tail of this hockey stick while scrambling a couple of metaphors in the process. So, is Social Security about to go bust? Not by a long shot. In fact, Social Security is in better shape today than at any other time since it was enacted in 1935. That’s because of some judicious adjustments suggested in 1983 by a commission set up by Ronald Reagan and headed up by Alan Greenspan. Since then, trust fund reserves have gone from nearly zero to $1.6 trillion. That very same April, President Bush held a domestic policy photo op and showed to the nation that $1.6 trillion trust fund. He didn’t open a vault that revealed a vast deposit of horded gold. He didn’t stand before a vast open plain beneath which was stored a huge reserve of oil saved for the country’s future energy needs. He didn’t even give us a glimpse what might be termed a social security “deposit book” reflecting cash reserves held in the nation’s banking system. No, what we got to see were the Old-Age and Survivors Insurance (OASI) Trust Fund intra-government bonds collecting dust in a file drawer in West Virginia. As of September 30th , the end of the 2006 federal fiscal year, the OASI trust fund had grown to $1.793 trillion. And just what does this “trust fund” represent? Well, it’s merely the largest single portion of what must certainly be the world’s largest IOU. And who owes that much to whom? Well, various agencies of the United States government have promised to pay that amount, in cash – that according to Yogi Berra is just as good as money – to the OASI trust fund when it needs to redeem those “intra-government bonds” to pay Social Security benefits. And where will the “various government agencies” get the cash? Where they always do – taxes. Please note that the Civil Service Retirement and Disability Fund is the second largest trust fund at a mere $0.68 trillion. From there on down the amounts get smaller with a total of $77 billion in “Other Programs and Funds.” Even the money in the “Pension Benefit Guaranty Corporation” is in the form of an IOU. No cash. Not a penny. It’s all not-so-funny non-money. Now, there are many apologists for this setup who will insist that the trust funds are real and are funded with U.S. Government securities, one of the safest investments you can own. But how does the interest and principle get paid on government debt obligations? Well, the government has two basic ways of raising cash: collecting taxes and fees or selling assets. If it could just “print” the money to fund its activities, why bother with collecting taxes in the first place? But doing this would merely debase the currency. This is better known in polite circles as “runaway inflation.” And so, taxes that had previously been collected for a specific purpose but spent on other things, will once again be collected to meet the originally intended financial obligation. And one thing that’s not so funny about this non-money is that these trust funds are basically a result of a large majority of politicians, whether Democrat or Republican, deceiving the American taxpayer about the true size of federal budget deficits. Or, those who are honest in their assertions regarding the viability of the trust funds simply don’t understand the problem. The trust fund fiscal chicanery comes in a form known as the “unified” federal budget. The budget is unified because it takes all of the money the government collects minus what it spends and says this is the “deficit.” What it doesn’t tell you is that some portion of the money collected and spent also represents a future obligation to fund some specific purpose, the funding of which has been deferred and passed on down the line for some other poor sucker to worry about. For 2005 the deficit figure you would have seen bandied about would have been the $318 billion shown under “Total” in the “Surplus or Deficit (-)” grouping. But the Federal Funds deficit was $555 billion. The difference between the two numbers is the excess of $237 billion the trust funds took in over and above what they spent on their respective originally intended purposes. And these monies were indeed spent. How do we know that? 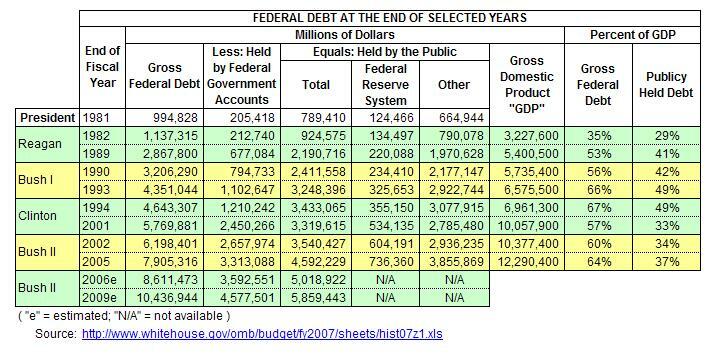 Though the amounts don’t match exactly, you can see that the total federal debt was $551 billion greater at the end of fiscal 2005 that it was at the end of 2004. This means that of the federal funds deficit of $555, $254 billion was financed through borrowings of cash collected by the trust funds. All the monies were spent, but the excess trust fund operating revenues are not reported as part of the deficit. Note the choice of years marking the end of a President’s term of office. Reagan was elected in November of 1980 and took office in January of 1981. 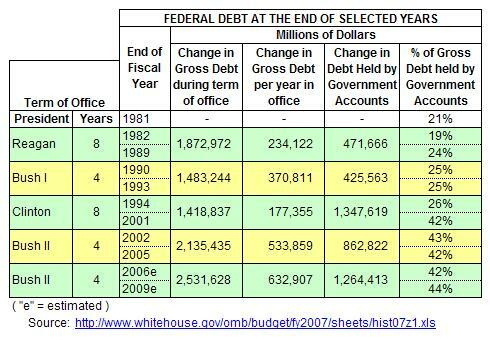 The end of fiscal 1981 was September 20, 1981. That year’s budget would have been the handiwork of the preceding President and Congress, and as such cannot be considered the result of Reagan’s budgeting or policies. And so, there is about a year-and-a-half lag between the election and the incoming President’s budgetary responsibility. The table given above takes this into consideration. The incredible shrinking deficit means that the federal government’s overall debt has also begun to decline as a share of the economy. 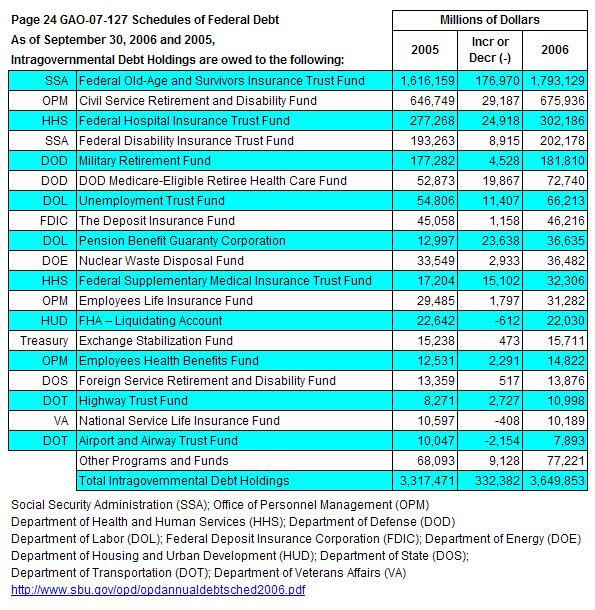 The final figures aren’t available, but our guess is that debt held by the public (the figure that counts because the feds have to pay it back) will have fallen in 2006 back to 37% of GDP or lower. The debt burden fell to 33% in 2001 but began climbing again as deficits grew in the wake of recession and spending to fund the war on terror. Now it’s falling once more. Noteworthy is the parenthetical statement about the “debt held by the public” being “the figure that counts because the feds have to pay it back.” Does this mean they don’t have to pay back the debt represented by the trust funds and shown in the column “Held by Federal Government Accounts”? If not, then taxes need not be collected to repay those debts. So where are the feds going to get the money to pay back Social Security, Medicare and the Civil Service retirement fund? Money that’s been spent. Not saved nor invested. If you’ve got some ideas, there are some folks in Washington that would just love to here from you. If you stop at the “Change in Gross Debt per year in office” column, Clinton certainly looks like a fiscal wunderkind. Just what he and the junior Senator from New York would like you to think. But over in the next two columns, notice that this comparatively small per year increase in the “gross debt” was financed almost entirely by borrowings from the trust funds. In fact, the percentage of gross debt held in the “Government Accounts” substantially increased from the beginning of Clinton’s first term in office until the end of his second – from 26% to 42%. The increase in the size of the trust funds during Clinton’s reign is nearly three times that during Reagan’s eight years in office. Isn’t “unified” budgeting a great gizmo? If you listen to the folks in Washington, you might think the federal government had a surplus of $69.2 billion for the fiscal year ended last September. This supposed surplus, coming after nearly 30 years of government deficits, has been cited as a cause for great rejoicing. Indeed, the Clinton Administration and the Republican-controlled Congress celebrated the surplus last fall in the way politicians enjoy most: They spent some more money. They were feeling so good that they increased their spending plans for the current fiscal year by $21.4 billion. Here’s how it affects the budget. By adding the Social Security system’s $99.2 billion surplus to last year’s $29.9 billion government deficit, voila, the federal bean-counters have created their $69.2 billion surplus (see charts). 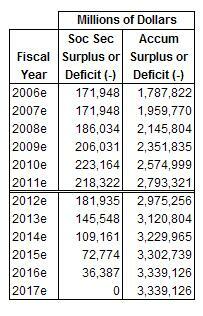 The same ploy is being used to transform this year’s deficit into a surplus. Included with the original article was a chart titled “Yes, Virginia, there still is a budget deficit.” And it’s obvious from the above cite that Mr. Epstein includes the Republican Congress as co-conspirators in this fiction. The Republicans liked consolidated budgeting so much that when Bush II got into office they kept tapping the trust funds at the same relative rate as did Clinton. This is illustrated by the government trust accounts staying at approximately the same percentage of total debt as they were raised to by Mr. Bill. However, if the estimates prove out, the total increase in the trust fund debt during Dubya’s eight years will climb to $2.127 trillion versus Mr. Clinton’s $1.348 trillion. Never let it be said that Republicans can’t outspend and out-borrow the Democrats. All while lowering taxes! So, when the President touts the fact that the deficit for fiscal 2006 came in at $248 billion rather than at the original White House forecast of $423 billion, take it with a very large dose of Pepto. Not included in that statement is the $332 billion increase in the “Intragovernmental Debt Holdings” that “are owed to the following…” If the real deficit stood up, it would rise to a total of $580 billion. That’s $0.580 trillion. No problem. Right? If all goes according to plan, over the course of both Bush terms the trust funds debt will rise by $2.0 trillion plus change. Change, in this case, being $12 billion plus change. The Federal Funds deficit, what we’ll call the “real” deficit, will average around $540 billion per fiscal year. And what about the Social Security trust fund that Bush seems to have been so concerned about? The Social Security operating surplus is forecast to max out at $223 billion in 2010. The figures below the double line represent a linear reduction in the annual surplus so as to reach zero in 2017. 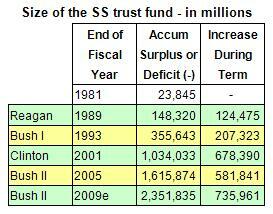 By that time the accumulated trust fund surplus should top out at about $3.3 trillion. That’s nearly double that of where it now stands. Must mean they’ll need two drawers in that filing cabinet in West Virginia to hold those precious securities. Hope it’s fireproof. Because of our ongoing and large trade deficits, foreign entities, governments for the most part, own an ever increasing share of the publicly held debt. If you combine the portion of the debt held in the trust funds with the debt held by non-U.S. persons, corporations and governments, it totals about 72%. Thus, U.S. citizens, corporations, trusts or any other non-federal entities hold only 28% of the total public debt. If all of this doesn’t greatly trouble you, perhaps you should read it again. Then ask yourself why the new Republican minority in Congress voted to keep the old guard leadership rather than persons desperately seeking to get the Administration and Congress to look behind the curtain. Someone like Rep. Mike Pence of Indiana perhaps? And why aren’t the Democrats pointing all this out as they carry forward the banner of fiscal restraint and responsibility?